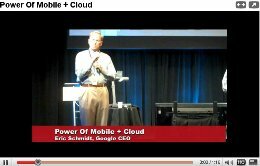 TechCrunch released a great video of Eric Schmidt, Google’s CEO, talking about the power of the cloud and of mobile phones. Specifically, as TechCrunch points out, Eric Schmidt is talking about the potential – the magical potential and power – of mobile phone platforms when combined with the cloud. What is the cloud you ask? As summaried from Wikipedia, the cloud is a virtualized version of the Internet that allows you to access data from anywhere there is an Internet connection. The mobile platforms, Android and the others, are so powerful now that you can build client apps that do magical things that are connected with the cloud. This is I think the most visually obvious example of that…don’t limit your imagination to this set of problems. Anything where you can produce this phenomenal customer benefit when you have a mobile device broadly defined connected to the cloud….Obviously we like the price of free because the consumers like that as well and we can figure out ways to use advertising to pay for it.